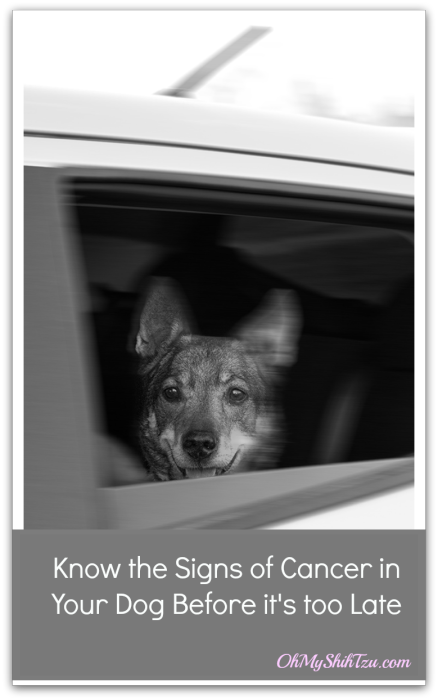 Cancer in dogs may be something you read about, heck you may have had friends whose dogs have dad it. If this sounds like you, consider yourself lucky. This was me until last November. It’s been 3 months since I found out my dog Kyra had cancer. Unfortunately by the time we found out , only days were left together. To be honest, I’ve been pretty numb about the whole thing. Why? Plain and simple, I missed the signs. When I look back, they were there…. I just didn’t realize. Bumps and lumps under the skin can be one indication something is going on or it can also just be a fatty benign tumor. Obviously you wouldn’t know until the lump was removed and sent off to a lab. So if you don’t do it now, decide today will be the day you start checking your dogs skin on a monthly basis to check for any unusual bumps or lumps. If you find a bump, don’t wait to see if it gets bigger, as cancer can grow rapidly and spread. Normally a dogs weight will remain constant. If there is a sudden decrease in weight, this may indicate something is going on. I don’t know about you, but my dogs go crazy when it is either breakfast or dinner time. Though this may not be a huge alarm, it should be discussed with your vet. If your dogs are like mine then they lay around the house all day long. But there is a huge difference in being lazy and being lethargic. Lethargic is defined as being a lack of energy or exhaustion. For example, years ago when Kyra was little I came home from work, and since my mother was visiting me told me that she had vomited earlier that day. When I asked her if she wanted to go for a ride, she just layed there and looked at me. I thought that was weird . I then asked her if she wanted a Greenie, and no response whatsoever. That was the indication to me something was seriously wrong. Does your dog not seem themselves? From staying away from you to maybe a sudden onset growl when you try to touch them? Changes in behavior can also manifest in physical changes such as a limp, slow upon getting up, and no longer being able to run or walking slowly. Is your dog experiencing diarrhea that isn’t a result of a change in diet? Has the diarrhea persisted more than a couple of days and does not seem to get better with bland diet? Call the vet immediately if this is also accompanied by other signs or symptoms. diarrhea could result in dehydration in your dog. There are many reasons for a swollen belly, it maybe as simple as a dog eating too much too fast, but that quickly appears and disappears at meal time. But that is only one reason. There are many other seasons that a belly can swell, and this isn’t a good sign. A swollen belly requires immediate attention. Please read this about Bloat and Stomach Dilatation in Dogs on PetMd. I am very sad I did not see some of the signs I listed above. Heck, she only showed 3 signs out of the 8 I mentioned, but no earlier than the last 3 months of her life. The summer before she competed in her last agility trial at 11 years old! I was so proud of her. She brought me great joy, and taught be so much about training dogs and what positive reinforcement can do. She was the best trail dog in the world, always a little bit ahead of me on a trail, but never out of sight. She was a friend to all dogs, big and small. When she was little I taught her to only lick little kids but not adults, something of which I regretted in the end. Her favorite treat was eating whipped cream from the can, which she did up until the last couple of minutes. I have been truly blessed with having some of the best dogs in the world… Kyra was the first. Yes, We had a QQ that day! Today we are joining Wordless Wednesday, though this post isn’t very wordless, in addition today I am taking Katie in for surgery due to a melanocyte found on her stomach. Yes, hopefully taking the steps of monthly skin checks will save Katie. 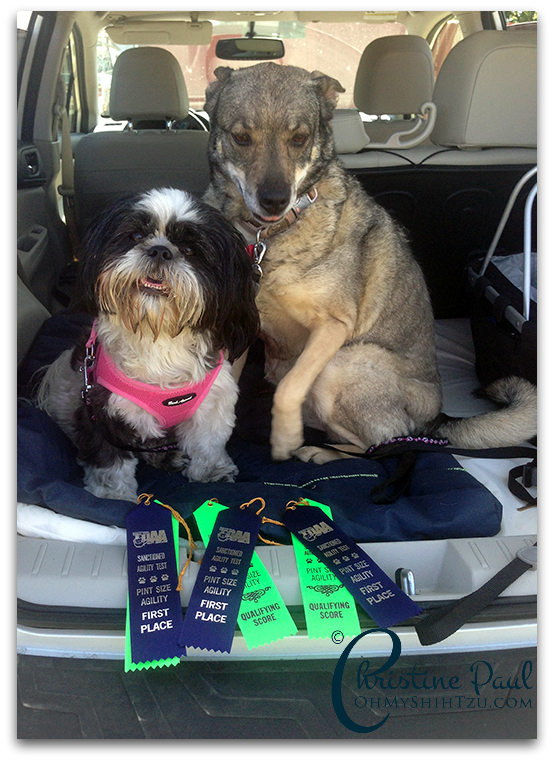 Wordless Wednesday is hosted by Blogpaws. Please visit my fellow bloggers for some great pictures and informative stories. I’m so sorry for your loss of Kyra. I know exactly what you went through. We missed the signs with our golden retriever Moses as well. By the time he stopped eating completely, it was too late. I’ll forever feel guilty about that. Now his sister has a different cancer, but at least with her we found the lump and hopefully the removal of it will be enough. Moses was our second dog to have cancer (Sheba will be the 3rd out of 7 dogs)….our first died of lymphoma at only age 6, and we found the swelling and caught it early with her. She did receive treatment and lived for a few months after her diagnosis. Sometimes it doesn’t matter how soon you catch it, cancer can be insidious. We just have to do the best we can. Kyra sounds like she was a wonderful dog! Its good to know the signs and what to look for – I’m guessing they’re similar in cats too. We have all our paws crossed for Katie’s surgery and good news! I hope to never have to go through this with Ali but this is a very good article on things to watch for. That must have been a difficult post to write, yet you did it all to hopefully help someone else. That was a very thoughtful thing to do. So sorry to hear of your loss.Please do not beat yourself up about not seeing the signs. Sending Doodle hugs your way, and keep us posted with the doctor’s reports please. So sorry to hear this news, very respectful and amazing of you to write a post like this, thanks for sharing. You have me crying very early in the morning….actually sobbing would be closer. What a beautiful dog and I am so sorry for your loss. My little Lhasa has diabetes and Cushings disease and I too wish I had paid attention to the earlier signs. He is 12 years old and has good and bad days but we are thankful for each and every one of them. I have 4 shih tzu’s as well that I rather hover over. Everytime one of them doesn’t want to eat or drinks a little more then I think is normal, I start to worry. Better though that I am aware of things then having them sneak up on me. Sounds like you dog had a wonderful productive life … you should be very proud. That’s really sad – so sorry to hear that. One other symptom I would mention is unusual bleeding. My last dog, Shadow, would sleep and when she awoke, I’d find a small pool of dried blood mixed with saliva. Considering how she loved chewing on sticks, Nylabones, etc – it never occurred to me that something more serious was going on. It didn’t happen all the time, so I wasn’t worried about it. When it did start happening more frequently and there was even more blood, I took her to the vet and at first the vet thought maybe a stick was caught back there in her teeth. They put her under to do a more thorough investigation and discovered a cancerous tumor attached to her upper palate and tonsil. It was an aggressive cancer and there was no way to completely remove it. I ended up just taking her home and making her comfortable with meds. She lived about another 2 months before the tumor was showing signs of cutting off her airway. That’s when I took her to the vet to have her euthanized – I didn’t want her to choke to death. She had no other signs of cancer other than that little bit of blood in her saliva. So sorry about Kyra and hope Katie checks out ok. I’ve lost 2 dogs to cancer in the last 5 years and a third one had melanoma which may have contributed to his death. Most cancers are inside and dogs hide their illness so well that they don’t usually show any symptoms until their condition is grave. Unfortunately we humans are usually shocked when they are diagnosed and have little time left to say goodbye. I am so sorry for your loss. I am in the opposite spot. Daisy was diagnosed with a tumor on her pancreas on Monday and she is still acting completely normal. The only way we knew she was sick is her blood work was abnormal when they tested it before planning to put her under for a teeth cleaning and lump removal. The lump is external and on top of a sebaceous cyst, so we knew that was a concern, but the pancreas was a complete surprise. She had no symptoms at all so far. We go to the U of M tomorrow. I am hoping they tell me I have options and more time with my girl. I cannot imagine having days left. Hurts too much. Sending prayer for Katie and comfort for you and your family. It is easy to look back and notice things, but it sounds like regardless she had an amazing and active life full of love! Hope she will be alright. It is hard to see the symptoms in older dogs as the signs are also just part of becoming a senior dog many times. Visiting the vet regularly and talking about behaviors is also very important. That is so sad and so very scary. Bentley has a lump on his back and I have had four vets look/feel it. They all say it is nothing to worry about. I can’t help it. Thanks for sharing your story and the signs. SO sad to learn the news – but grateful for you passing on the info.